The site is one of Caesarea's three prominent sandstone (or kurkar, seen in photo at right) promontories or islands projecting into the Mediterranean. Herod employed two as the basis for the harbor. On the third, and most southerly, is the palace. From this promontory, the city and harbor are viewed panoramically, and there is controlled access to the palace by sea and land. Until recent years, the only visible sign of palace was a great rock-cut pool (35 x 18m.) with a central base (below, left).The pool area is surrounded by foundation cuttings. Still known locally as "Cleopatra's Baths" or the "Piscina," the pool and cuttings have been surveyed by various archaeologists at Caesarea. 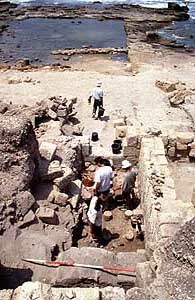 During Hebrew University excavations in the harbor area between 1976-79, the team studied the promontory and identified the rock cuttings as the foundation walls of a large palace. The amphitheatron was discovered in 1991, finally making sense of Josephus' description of the building being along the coast in the south of the city (AntJ 15.341). The Upper Palace, wedged between the stadium and the Lower Palace, was partially excavated in 1993, but full realization of its plan came in the following three years and is still in progress. Ehud Netzer directed the first systematic excavations on the promontory in 1976 with L. I.Levine and Hebrew University of Jerusalem. The team documented the rock cuttings on the promontory and began digging the one preserved side of the building: the east range of rooms. The results suggested a luxuriously-appointed building of some 110 x 55m. The east range comprised large central hall, or triclinium (93.5m2), with two small flanking rooms to each side (right). The triclinium and one room on each side were adorned with well-crafted geometric mosaics (below left) and traces of wall plaster imitating marble revetment. An entrance stair was located at the northeast corner. The earliest pottery from the site, recovered in a sounding near the entrance stairway, dates to the late 1st c. B.C..-early 1st c. A.D., but the context of this material was unclear and further clarification was needed. The dramatic siting of the building, its walls battered by the surf, provided the strongest evidence that the palace was Herod's, recalling his palaces at Masada, Jericho and Herodium, where Herod engineered difficult and beautiful terrain into luxurious residences. Evidence that pozzuolana was used in the construction of features in the pool added evidence that the pool was constructed when this cement was imported for construction of the harbor. In sum, the configuration of the building, its siting, and technical aspects of its construction, provided a compelling basis for identifying the promontory palace as that of Herod the Great. Further stratigraphic excavation was required to establish a ceramic chronology and answer questions about the extent and phasing of the building, which appeared to have survived through the Byzantine era. In 1990, Netzer and a Hebrew University team returned to the site with Kathryn Gleason, Barbara Burrell and a group of 20 student volunteers under the sponsorship of the University of Pennsylvania. The season produced important new additions to the 1976 discoveries, consisting primarily of evidence for the development of the east range during the Roman period. Excavations that season revealed that, in the Roman period, the triclinium and its rooms were provided with a small caldarium, whose hypocaust (right) and furnace were well-preserved. A tile used in the furnace bears the stamp of the Tenth Legion Fretensis. Atop destruction debris in the southernmost room of the east wing, excavators found two inscribed marble columns with six dedicatory inscriptions. These revealed important new information about officials of Caesarea from the 2nd-4th c. A.D., including a previously unattested "curator of ships of the colony of Caesarea." Finally, excavations in 1990 revealed the eastern exterior wall of the palace, approximately where anticipated. The picture was not so simple, however: the wall was composed of many component segments, most obscuring the line of the original wall; furthermore, heavy rains later that winter washed down a baulk outside of this wall, revealing a new eastern wall parallel to the earlier discovery. Only in 1993 would it become clear that it was the stylobate for the colonnade of the Upper Palace. In 1992, a new phase of archaeology began in Israel, with funding provided from the Ministry of Tourism to employ new immigrants through the Caesarea Development Project to excavate archaeological sites and develop them for tourism. On the promontory, excavations, now under the sponsorship of the University of Pennsylvania Museum, but in collaboration with Netzer and Hebrew University, continued to focus on the lower promontory. Ten workers from the new employment project joined an international group of 16 volunteers. Work in this season yielded additional stratigraphic information about the furnace and entrance stairwell. We uncovered the rear wall of the triclinium for the first time, which proved to have an apse and semicircular pool, with a central cutting probably once housing a central fountain. Excavations to the east, or outside, of the palace wall, up on the upper promontory, produced a variety of fills over quarried bedrock, but no distinctive features. All trenches lay outside of the security perimeter fence for the theater compound, restricting further excavation to the east. By 1993, the Caesarea Development Project had escalated and the study excavation strategy turned to one of "rescue" excavation in advance of expansion of the National Park's facilities. The security fence on the upper promontory was removed and the Penn team agreed to take on excavation of the full upper promontory; however, prior to issuance of the 1993 permit, the IAA reallocated the eastern half of this upper area, then a parking lot, to IAA archaeologist Yosef Porath, working on a year around basis on the adjacent amphitheatron, to expedite excavation. Although no one at that time knew what lay beneath the dirt parking lot, the boundary ultimately divided the underlying building cleanly in half, through the courtyard and preserved northern rooms of the Upper Palace. The 1993 Penn season, which ran from mid-July until the end of October that year, with two rotating teams of up to 40 workers and volunteers, revealed the first outlines of the Upper Palace; and the 1994 season, lasting only six weeks, but with a full complement of 30 workers and volunteers, filled in important gaps. The Upper Palace was found to consist of rooms disposed alongside a large central courtyard. Along the eroded south side of the courtyard, down on the beach, two walls suggested the remains of the palace platform to the south. Aided by the discovery of a central base or small platform, we were able to reconstruct the full dimensions of the courtyard (42 x 65m). These were confirmed later in the year when the IAA team undertook full-scale excavations of the eastern half of the palace. The courtyard contained a system of water features. Just south of the central axis of the courtyard, Penn excavators found a channel feeding into the corner of a cistern. The IAA team later revealed the cistern to be one of two large stone tanks beneath the central axis of the courtyard. In 1994, a well (left) was discovered at the west end of the water channel, possibly the source of the water for channels later found in the IAA area, if not for the cisterns themselves. At the bottom of well, a cache of some 60 lead defixione, or curse tablets, were recovered during wet-sieving. These tablets and an associated assemblage of coins, dating to the 4th c. A.D., are discussed by Barbara Burrell on another page. A small plastered floor was excavated to the south of the well, at a lower level. Its purpose is unclear, but it perhaps served for water raising. The surface of the courtyard is paved in crushed kurkar, and in some areas a plastered surface was preserved. Beneath the surface, irregularly quarried bedrock was leveled with a red-sandy fill, with a few Hellenistic sherds, or more crushed kurkar. This courtyard is discussed more fully below. Surrounding the courtyard, a colonnade was supported atop a stylobate of ashlar blocks set into straight-sided box-like foundation trenches cut into the bedrock. Only one base was found in situ, but careful sleuthing by Williams revealed a repeating configuration of blocks that provided the intercolumniation of the colonnade. Better preservation of column bases in the IAA sector would later confirm the finding. The bases were carved in the local kurkar sandstone and then coated in plaster. Various column segments and partially carved capitals have been found in the Penn excavation area, but none can be definitively associated with the colonnade, so the architectural order is unknown at present. The central feature of north wing of the Upper Palace was a large hall (192m2). Paved at the time of its destruction in ornate geometric mosaic "carpets" of the Byzantine period, the room had evidently received many alterations while keeping its essential architectural form of the 1st B.C. We identify the room as an audience hall, cautiously holding the view that it was in such a room that the governors of Caesarea received Paul, among many others, for hearings. Set into a rock-cut trench a across the back of the room, excavators found an unusual hypocaustal heating arrangement supporting an open area of heated floor with no evidence of adjacent bathing facilities. Smaller rooms flanked the hall to either side. Those to the west were excavated in 1993. The chamber walls immediately adjacent to the audience hall were totally destroyed by looting, leaving only a jumbled fill of flue and roof tiles, and footings cut in the bedrock for foundation walls. Further west, however, an intact, roofed chamber was discovered late in the season, filled to the ceiling with rich deposits of domestic debris. This feature was identified at first as a small cistern, although it would later prove to be a spring house. In 1994, excavation of the spring house resumed, and the chamber was found to open onto a smaller chamber and tunnel completely carved into the bedrock south of the opening. Its section is similar to chamber tombs in the area, suggesting that it was originally part of the Hellenistic cemetery (see below), but its alignment with the architecture of the palace puts this interpretation into some question. Immediately to the north of this spring house, excavations revealed two superimposed pools and to the east, a small small chamber heated with a hypocaustal floor was discovered at the surface level. A large drain was also cut deeply into the rock in this area, draining the pools out to the north side of the promontory. In this northwest area of the palace, the bedrock was never quarried, and it was here that the majority of rock-cut cists from a pre-Herodian (Hellenistic) cemetery were found in 1993 and 1994 . Although the north side, the promontory has eroded into the sea, however, a leveled surface in the kurkar suggests the footing of a the exterior palace wall atop the unhewn kurkar escarpment. Although the footing of the wall is very different, it continues the line of the heavy ashlar retaining wall to the east that binds the upper palace platform to the amphitheatron in the IAA area. Hellenistic burial cists were also found in this area. To the east of the audience hall, flanking rooms and a corridor were discovered before reaching the boundary with the IAA area. These rooms were paved in fine, complex geometric mosaics set into fields of white mosaic. Preservation was poor, overall, and construction of an access road over the site to the IAA area from 1994-1996 has prevented detailed study of the rooms. The 1995 and 1996 seasons were devoted to answering specific questions and finishing uncompleted projects. By 1995, funding for the overall employment program ended. Twelve staff and volunteers excavated the baulks of the upper promontory and prepared measured drawings of the site, working with A. Iamim and S. Sacks to integrate the plans into the joint city plan on AutoCAD. In 1996, we returned with a small, veteran staff to complete the excavation of the stairwell area, the spring house, the cuttings on the promontory, and the mosaics. We anticipate one further season in the field to carry out the technically difficult excavation of the contents of the great pool, most likely unstratified . Feasibility studies there in 1994 revealed good preservation of architectural fragments and the presence of a small, presumably ornamental structure at the west end of the pool. Throughout the history of the promontory, an accurate understanding of its prominence in the urban plan has been hampered by the fact that it had never been accurately surveyed in relationship to the main coast. On the Napoleonic maps of the later 18th and early 19th century (Gray's systematic coastal survey of 1863, and Conder and Kitchener's Survey of Western Palestine II), the promontory seems to be sketched rather than surveyed: its form bears little resemblance either to Pococke's plan of 1745 or the promontory as seen today. In spite of the introduction of aerial photographs, the situation did not improve in the twentieth century, and many of the urban plans produced of Caesarea by archaeologists show the promontory as a small, innocuous nub projecting off of the coastline. In 1993, the promontory was finally linked to a larger laser theodolite survey of the mainland. In 1995, Anna Iamim produced the first AutoCAD-generated map of Caesarea fully coordinated with the architectural records of all of the archaeological teams involved at Caesarea. The promontory palace emerged, for the first time since antiquity, as one of most commanding sites of the city.